COOKING CLASSES AROUND THE COUNTRY CATER TO ALL TASTES. TRAVEL TO CHICAGO, NEW ORLEANS, SAN FRANCISCO, NEW YORK CITY AND CHARLESTON TO HAVE A LOOK AT WHAT�S COOKIN�. After years of sampling international cuisine, Americans have become quite sophisticated in what they eat�and, as a result, they are beginning to seek exotic flavors with almost frantic zeal. To satisfy this new American palate, recreational cooking programs are popping up everywhere. Mesmerized by the promise of becoming top chefs, students eager to learn from the pros are grabbing their aprons and racing off to cooking classes in record numbers. And food enthusiasts wanting to take their dishes to the next level are using travel getaways as a chance to learn from the very best. It�s important to note that much of what is available in culinary schools is of no real value to home cooks. And what is hot and popular today is often d�class� tomorrow. Although certain international cuisines like Italian and French are always in vogue, the way these foods are prepared is constantly changing. those heavy French sauces, for example, long adored by gourmands, have been washed down the drain. The new rage is eating healthy, lightening classic dishes by using techniques like making reduction sauces (usually from meat juices) that intensify the primary flavor. And those exotic ingredients from around the world, which everyone has come to love, are being delicately introduced into almost everything�from salads to entr�es�with the kind of imagination and skill you can take home with you. Since food fads come and go, you might want to consider focusing your training on mastering universal skills and techniques, which, regardless of the trends, will always have value in the kitchen. 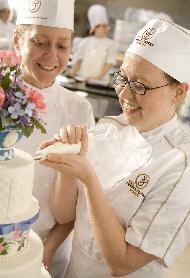 At the French Pastry School in Chicago, for example, students are taught to approach cooking as professionals, giving them skills that can be applied to serious cooking. The staff of talented pastry chefs�including two international stars, Jacquy Pfeiffer and S�bastien Canonne�believe one way to do this is through repetitious exposure to the best techniques. Pfeiffer encourages his students to �strive continuously to refine their skill by trying over and over again to outdo what they�ve already done, until they have reached their highest level of excellence.� the end result will be a pastry cook who can design something with taste and beauty, suitable for a gala dinner. But using the best ingredients and polishing them to perfection through practice isn�t enough. there is another requirement to successful pastry making. A student must learn to layer flavors in proper balance to bring about a compatible taste interaction. Upon completion, the dessert must be �a total sensory experience, engaging not only your sense of taste, but also your sense of sight, smell, touch and sound (through texture),� Canonne says. Frank Brigtsen, who teaches regularly at the New Orleans Cooking Experience, says that building meals one ingredient at a time is fundamental to creating a rich taste that makes good food so special. This former student and longtime friend of the famous New Orleans chef Paul Prudhomme believes the real test of a meal is how it tastes�and creating good taste means building deep flavors through careful attention to each step of the preparation. �One of the tricks is to maximize the special flavor of each ingredient through separate preparation (like saut�ing onions first) before introducing it to the other ingredients,� he says. The key to good cooking is keeping food flavorful and exciting without the addition of the chemicals and additives so many home cooks have come to rely upon. Achieving this requires using fresh ingredients�ideally in-season and organic�acquired directly from the producers. Nowhere is this ethos as prevalent as it is in California, especially at the Relish Culinary Adventure in Sonoma County, an hour and a half north of San Francisco. As many foodies already know, the Sonoma-Napa area isn�t just famous for its magnificent wines, but also for its excellent cuisine�of the healthy, organic, seasonal, right-from-the-garden variety. At Relish, food enthusiasts will learn all about healthy cooking from top local chefs like John Ash, Charlie Palmer and Mark Stark in a heavenly countryside setting. � Warm olive oil and garlic in a saut� pan until garlic becomes golden brown. Add olives and fry until they begin to wrinkle and color. Add pine nuts and stir until golden brown, then add chopped herbs. Spread mixture on paper towels to cool. � Bring fish to room temperature and season with salt and pepper. Let fish rest on a plate. When it begins to �sweat,� wrap each piece with a slice of bread. � Melt butter on medium high heat in an iron skillet or nonstick pan. When it starts looking foamy, add wrapped fish and rosemary sprigs. Saut� for about 3 minutes or until toasty brown. Flip only once as it will become soggy if rolled around too much. � Drain fish on a paper towels and keep warm (the longer it rests, the less crispy the final dish). Mix all ingredients together and keep cold in a sealed container. Warm olive mixture and add grapes. Spoon onto middle of the plate and place fish on top. Spoon vinaigrette around dish and serve. Serves two. Photos courtesy Relish Culinary Adventure, LLC and The Institute of Culinary Education. The French Pastry School: Paul Strabbing. All rights reserved. This article was published in Go magazine (AirTran Airline�s in-flight magazine) July 2008. It is from Joe David�s book Gourmet Getaways (Globe Pequot Press, April 2009). It is generally agreed that you must first master basic cooking techniques and skills before tackling the more advanced lessons. For this, you should consider the Institute of Culinary Education in New York City, which has an extensive selection of recreational cooking classes. At the center of its programs are classes in the Techniques of Fine Cooking, which are especially useful for beginners. Rather than focusing on a particular recipe, the multisession course helps students master techniques that can be applied to any recipe from fruit to fish. During each class, students are introduced to important concepts that will always serve them in the kitchen (such as why things go wrong and what can be done about it when it happens). They are taught major cooking methods like grilling and saut�ing, and are given lessons that will provide them with a firm grasp of ingredients and equipment. To tie all this together into one perfect package, aspiring home cooks might want to take a private class with a talented chef like Nate Whiting at the Woodlands Resort & Inn, near Charleston. In the tradition of his predecessor Chef Tarver King, Chef Nate teaches students how to prepare food that is appealing on all levels�from the way it's presented to the way it tastes�using the highest quality ingredients, flavored with organically grown herbs and vegetables from the garden. Each student taking a private Chef du Jour class will work alongside the chef and his staff, preparing some of the evening's menu at this well-respected, Mobil Five-Star, Relais & Chateaux member property. Although these five programs aren't designed to open the door to professional stardom, they will create educational and recreational experiences. Under the watchful guidance of respected professionals, you will be introduced to skills and techniques of lasting value. For diligent, serious-minded students, a cooking class may be all that's necessary to lead to that magical moment in your own kitchen in which you become the culinary star in your family's universe. Satisfy your craving for a cooking lesson at any of these culinary schools, all of which offer both chef demonstrations and hands-on classes.